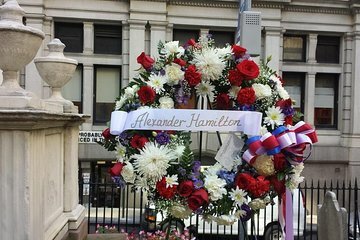 Explore Lower Manhattan on this 2.5 hour walking tour that highlights the impact of Alexander Hamilton on American history and NYC culture. Follow your guide past iconic landscapes, towering skyscrapers and more. With a small group cap of 10 people on weekdays and 15 on weekends, this unique opportunity ensures a personalized experience. Your friendly guide will use the art of storytelling to unlock the past and allow travelers to feel like they are observing the events as they happened! Follow your guide on a trip through history and learn about the Duel that Changed a Nation (the one between Alexander Hamilton and Aaron Burr). Journey into the streets of Lower Manhattan, past architectural icons and towering landscapes as your guide tells stories that bring the past to life. You'll experience the city before, during and after the American Revolution and learn how the Big Apple was torn apart, burnt down and rebuilt before becoming one of the financial centers of the world. Your guide will share tales of political debates gone wrong and point out some of the oldest remaining buildings in the city, like Federal Hall and Trinity Church Graveyard. You'll also see the same sites as Alexander Hamilton and Aaron Burr as you follow their path to the duel that took place in 1804. See original historical documents, plus letters between Hamilton and Burr on this fascinating tour that brings history to life for the entire family. • Wall Street: Law offices of both Hamilton & Burr, Bank of NY, 1st Bank Bailout, Federall Hall and more! When it is finished you can make up your own mind about what happened that day and why. This tour should not be missed if you enjoy American History! Karen was so knowledgeable and such a great presenter of Hamilton's and Burr's lives. She told the history objectively of both men and left you wanting to read and study more! Absolutely loved the Hamilton and Burr Walking Tour. Karen Q, the tour guide, is so knowledgeable about the subjects and shares so much information that you actually feel like you went back into history. We had two 8-year-olds with interest in history with us and they were able to recount many facts that they learned on the tour. We would definitely sign up for other tours like this one. Karen was a perfect tour guide! She has so much knowledge and presents it very well. We will be back for more of her tours for sure! Very informative. Karen is an extremely knowledgable guide and corrects many of the falsehoods about Hamilton and Burr that are widely known to the public. IT has a good pace, but 3 hours, vice 2.5 may be more appropriate. An excellent segway to anyone going to see the play HAMILTON, in the future. Fabulous! I learned so much about the history of this time, of NYC, and Burr and Hamilton. I have been to NYC many times and this tour took me to places I never even know existed. Well worth the money! Tour guide was very good and informative, she definitely knew her stuff and had lots of information to share. You definitely get to see many of the important spots along the tour. Only thing I would change is the length does get a bit long especially when it is continuous outside in full sun. More places to sit while listening would have been appreciated by hour 2.5 it was getting uncomfortable! Karen was extremely knowledgeable and informative. We were lucky to have a small group on the day we were there. It was an easy walk with several stops for discussion of history and politics of the time period. We got more information than just walking around ourselves and Karen provided a lot of unusual facts and add ons which really made the tour enjoyable. She also answered any questions we had and happy to add more color to the history. This tour with Karen was the highlight of our trip. I worried that a tour would be a repeat of the basics that every Hamilton fan already knows. Not the case! Karen is a historian, and her passion and knowledge for the era had me leaning in for every story she would share. I learned so much! It was fabulous! Karen was an amazing tour gude and an epert on the subject. My husband I and I loved it and will plan another tour on our next visit!